When you think of Italy, you think of Rome. Venice. Florence. Probably Milan. No one thinks of Turin. Turin is underrated. Lots of people think it's just an ordinary industrial city. I did, too. And the city proved me wrong. There are tons of reasons why you should book your next Italian trip to Turin. For once, it was the first capital city of Italy. Yup, you probably didn't know that. Turin is home to Vittorio Emanuele II of Savoy, the first king of the Kingdom of Italy. Although many other cities of Italy hosted noble families that reigned in the level of city-states, only Turin could claim itself as the first capital of the unified Italy. Turin is full of beautiful palaces in its grand squares. As babygirl said, it's full of the homes of Prince Eric (she's currently into Little Mermaid). The squares look amazing, the main square, Piazza Castello, has unusual water fountains coming out the floor surface which babygirl enjoyed so much. It also has direct view to the Royal Palace. If Piazzas and Palazzos are not enough for you, Turin also hosts the infamous Mole Antonelliana, also known as the Eiffel tower of Italy, now hosting the National Museum of Cinema, the tallest museum in the world. We wanted to take the panoramic elevator ride to its top, but we didn't make due to our limited time in Turin, so this tower is our first reason to come back to Turin soon. You're familiar with hot chocolate, and a big fan of chocolate spread. But you don't know where they were invented. Yup, in Turin. Since 17th century, Turin has been known as the chocolate capital of Europe. The famous chocolate spread with hazelnut Nutella? It started in Turin. There was a shortage of cocoa beans during the Napoleonic war, giving the idea for the locals to add hazelnut to get the cocoa texture. Later, Ferrero started to sell this hazelnut chocolate snacks for children, then the hot weather melted the chocolate and, there you go, Nutella was invented. If you're not a fan of chocolate, you still can eat well here. Turin is a home of grissini (breadsticks), which babygirl loved. The local pasta and risotto are cooked with local porcini mushroom (my husband's favorite) and truffles. I had the chance too cook tagliatelle with fresh truffles for the first time in my life, here! The streets of Turin are full of romantic little restaurants, pizzerias and cafes with the best coffee. One of our favorite part of the days was having breakfast (croissant a la crema, yum!) at Antony's bar close to where we stayed in Via Nizza. This one is our second reason why we need to come back to Turin, because we didn't manage to visit this one! And we really, really wanted to. If you love Egyptian antiquities, or you really want to go to Egypt but didn't have to chance yet, or you had visited Egypt and feel nostalgic, you should visit this one. It hosts over 30,000 important artifacts including a collection of statues representing all the kings of the New Kingdom, mummies, papyrus and books of the dead originally belonging to the Drovetti collection and a painting on canvas dated from 3,500 BC. The museum's main entrance was featured in The Italian Job movie. I personally think Turin is much more child friendly than Venice, Rome and Florence. Don't get me wrong, the whole Italy is child-friendly. In our several trips to Italy, I can't remember any single shop, cafe or restaurant whose staff wouldn't offer free treats, gifts, souvenirs, foods to babygirl. Everyone's simply in love with babies. But Turin is special. The fact that it's not (yet) world famous like Venice and Florence makes it a more relaxing city. Unlike in Florence, we could stroll in Turin and enjoy the city with no fear that we'd lose sight of babygirl running in the crowd. 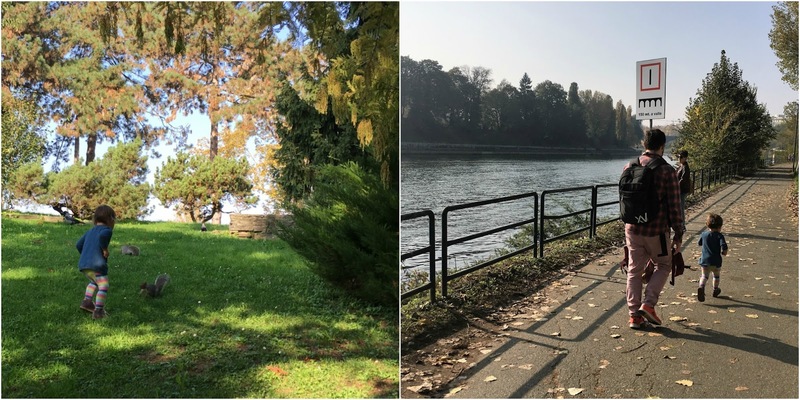 Strolling along Po river in Turin was also much nicer for her than it was along Arno river in Florence (where there was traffic jam of people walking, in November!) We found a lot of playgrounds in Turin which she enjoyed a lot, and, if your child is a big fan of squirrels like ours, Valentino Park of Turin is the perfect place. There are zillions of squirrels which are used to interacting with humans running around the huge beautiful park which also host the Medieval town and Valentino Castle. Back in the late 90s until early 2000s I was a loyal fan of Juventus FC, a football club from Turin. I watched every single match of Serie A -the highest level of Italian football league. I don't follow any of national leagues now, but there's a part of me that has always wanted to visit Turin. My husband doesn't watch the sport regularly either, but he's always in for a stadium tour, and he's collecting official jerseys of football clubs (which I think is super lame). The stadium tour -cost €22 for each- was cool, would've been cooler if I were still into Serie A today though. We were on the field, and we saw almost every room in the stadium, including the locker room. The tour ended in the museum which hosts memorabilia of the club since its establishment, and we closed our day in the official store. My husband got himself an official jersey and babygirl got herself a stuffed zebra which is the mascot of the club. If you're not into football, but you're into cars, you should definitely check the National Museum of Cars. Yes, Turin is home to FIAT, but the museum hosts around 80 automobile brands with over 200 cars including ones dated from the 19th century. We really wanted to visit the museum but we decided to save it for our next visit.